"You're going to love this," I overheard one woman say to her friend in the lobby. "It's just like a big party." 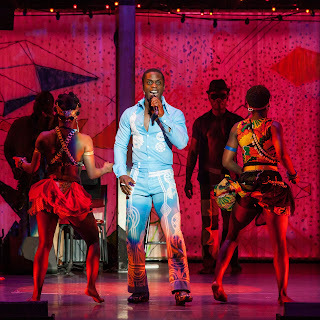 It's not a bad description for FELA!, Jim Lewis and Bill T. Jones exuberant and invigorating slice of the larger than life Nigerian musician-activist Fela Kuti. Certainly, that's where we start- the familiar Harman Hall stage has become The Shrine, Kuti's own club and the frequent scene of all-night music and dancing and, oh yes, violence and danger when the army is forever lying in wait. The party doesn't last forever, but, well, we're not there quite yet. The top of the show is a riot of bright colors, music dancing, and magnificent jumpsuits, and the audience is quite literally beckoned to join in. FELA!, a touring version of a show that originated Off-Broadway and successfully managed the transition to Broadway and later the West End and around the world, has a tough job- how do you condense the explosive life and talent of Fela Kuti into one theatrical event? Especially when a good percentage of its audience has only a limited knowledge of Kuti's story going into the evening? That's where my friend in the lobby is smack on the money- you make it a party. The stage is packed with a ten-man band and an ensemble who throws themselves into one high-energy number after the next. 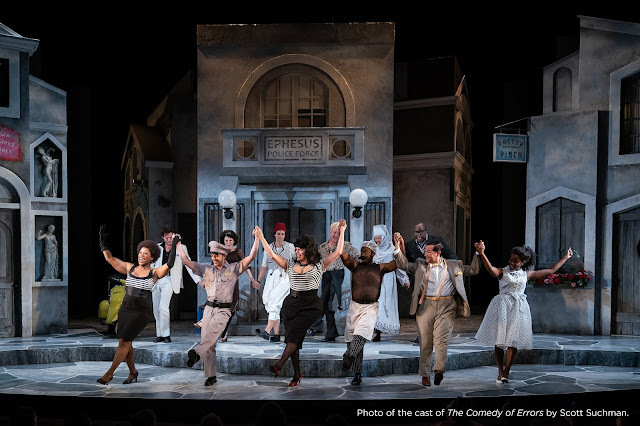 Bill T. Jones's choreography is electric and unrelenting and lets the audience revel in individual talents in a way that continually serves the illusion of The Shrine and our story. The real star is, of course, Adesola Osakalumi's performance as Fela. I'm not sure if he ever leaves the stage for more than a moment or two (I think there's time for a second act quick change, and that's about it); he's constantly the ring leader, speaking directly with the audience and telling his story, dancing and singing and building the frenzy onstage. He's riveting and an absolute star, but he's not the only standout performance. 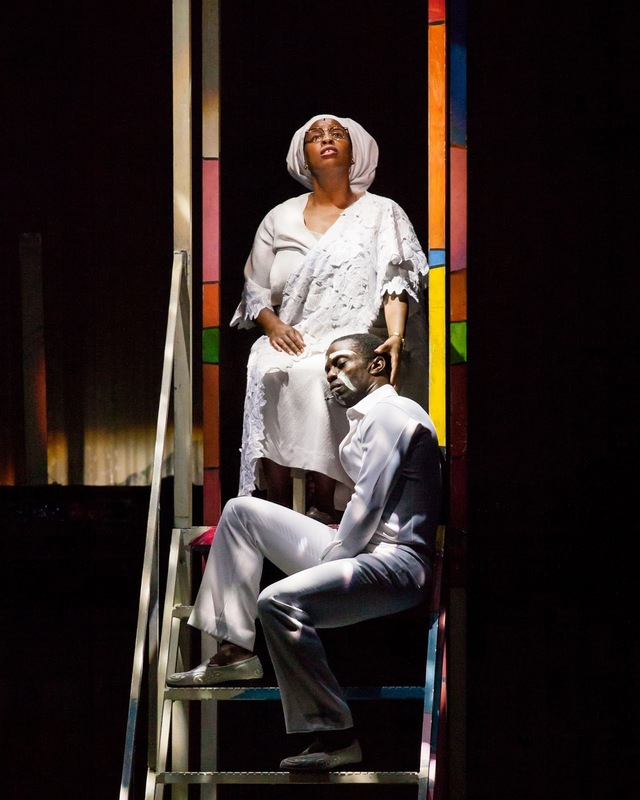 Melanie Marshall, as Fela's crusading mother Funmilayo, has a voice that I feel lucky to have heard- rich and gorgeous with an effortless upper range that gave me genuine chills. 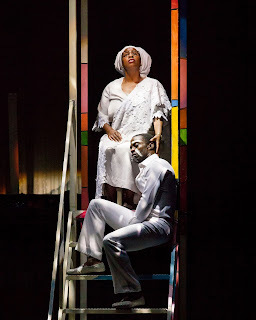 Melanie Marshall as Funmilayo and Adesola Osakalumi as Fela Kuti in the production of FELA! presented at the Shakespeare Theatre Company. Photo by Sharen Bradford. Considering the source material is the life of a man who spent most of his life fighting back against the repressive military dictatorship that ruled Nigeria, the party is bound to come to a sobering end sooner or later. It's not a perfect play by any means (the second act lacks a lot of the momentum and relative clarity of the first), but it's surely a powerful one. FELA! is not a shy play- it can't be, not if it wants to depict Fela Anikulapo-Kuti in anything like a realistic portrayal- and it doesn't back away from making its audience uncomfortable and shining a light on events most people would rather not face. For all that The Shrine exists for music and dance and bacchanalian splendor, Fela tells his audience again and again "Music is the weapon." It can be a blunt weapon at times, but in the hands of this show and these artists, it has an relentless energy and an undeniable charisma and magnetism. Before the first act was halfway through, I was mentally compiling a list of people in my life that needed to see this show, and by the end of the night, I was damn glad that I was lucky enough to be in the audience. FELA! won't be in DC for long, so get yourself down to Sidney Harman Hall for this weapon and this party.